I often get asked if glassware is important for beer and, if so, which beers should go in which glasses. The glassware series will attempt to clear up some of the mystery involving glassware. I will start the series with the pilsner flute. No other beer style has had such a profound effect on the beer world as the pilsner. First created in 1842 in the town of Plzen in the modern day Czech Republic, the pilsner revolutionized the way consumers drank and what brewers produced. Czech pilsners are known for their light golden straw color and brilliant clarity. These two characteristics are taken for granted today, but in 1842 most beers were brownish in color and likely very cloudy due to quick fermentation times and a lack of filtration. Even more interesting is that not many people knew what their beer really looked like. In those days, beer was poured from wooden casks into tin, pewter, earthenware or wooden mugs. Glass was a novelty of the rich and very few common folks could afford to own glass drinking vessels. This all changed right around the same time that the pilsner was introduced. It is believed that this had a huge impact on the immediate success of this new beer style. New technology in glass making finally made clear glasses affordable to the masses. What better way to show off your new toy than to put a crystal clear, brilliantly golden beer in it? Of course, the rest is history. The pilsner swept through Europe with everyone either ordering it from the source or attempting to replicate it on the local level. In the US, this wave of pilsner-mania happened to coincide with a large number of German immigrants coming to the US and setting up shop as brewers. Of course they brought the beer trends with them, and so the pilsner became the ubiquitous beer of big American brewing. Pabst, Schlitz, Miller, Blatz, Anheuser and Busch all brewed pilsners right from the start. Of course the versions we have today from those companies have very little in common with the original recipes due to a variety of issues to be covered in a later blog entry. The shape of the pilsner glass is best suited to any light beer that you want to keep cold. 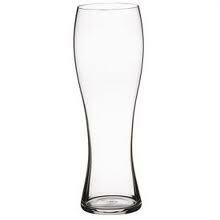 Pilsner glasses, or "flutes" as they are often called, have a firm base of significant width to prevent spills. Above the base you will find a stem, sometimes integrated as shown in the picture to the right, sometimes separate as in the example below it. The purpose of the stem is to give the drinker a place to put his or her hand. The idea is that the heat of the hand will not transfer as quickly to the beer. The slender taper of the glass over a significant rise is used to maximize the amount of light shining through the glass. This will help show off the beautiful clarity and color of the pilsner. The narrow but tall design allows for maximum head retention at the top of the glass. In the United States we often pour our pints to the brim to feel like we are getting the most bang for the buck. 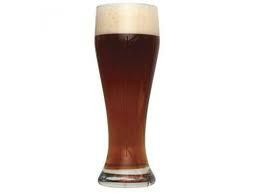 In reality we are depriving ourselves of the rich flavor experience that beer foam adds. Foam is a trapped area of aroma compounds bursting with scents that add to the true enjoyment of your beer. PIlsner glasses can be used for anything light and clear that you really want to show off and keep cold as you drink.